Facebook is a social media platform that needs no introduction. With over 2 billion monthly active users, it’s a no-brainer that you absolutely need to market your dental practice on the platform to gain new patients. Imagine being able to reach new patients on the platform they trust and are already spending their time on… yeah, that’s Facebook. Since trying to get new patients is the number one problem modern day dentists face, Facebook Ads can be a powerful tool and an untapped resource for dental practitioners in search for new patients, if used correctly. Now, the traditional methods of media advertising for dentists induced a lot of cost with minimal results. But Facebook has turned the digital marketing sphere for dentists upside down. How? With Facebook Ads, dentists can choose their specific target audience and it’s size according to their own budget. Also, as your ad is shown only to a relevant audience, you get improved results. A win-win, for both dental practitioners all over the world and Facebook itself. But what is a Facebook Ad? Facebook offers two forms of advertising: Ad Campaigns and boosted posts. A boosted post, on the other hand, is something entirely different as it focuses only on your current following and their family and friends. Facebook lets you ‘boost’ your status update to make sure it is viewed by your followers and their friends and family so its best to use this form of advertisement to push an offer to your existing followers. And it’s cheap, you can boost a post for a day for as low as $1. When advertising through a Facebook Ad, it’s important to make sure that your ad contains a nice copy, stunning visuals and an irresistible offer to get results. But the real power of Facebook Ads for dentists is your ability to showcase your ad in front of a highly relevant audience selected by you. Targeting your Facebook ads to the people who already like and trust you is a great way to begin with your marketing efforts on the platform. The engagement you’ll receive on this form of targeting will be the highest as you’re targeting patients who already trust you with your services. Use the custom targeting option on your Facebook Ads and add all the email addresses you have in your database to target these people on Facebook as well. 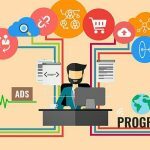 You’ll get high engagement rates on this type of targeting as well because people who already have taken the action to submit their email addresses to you will have no problem in taking action again. So, start targeting your email subscribers on Facebook as well along with your regular email campaigns to raise awareness of your dental practice. 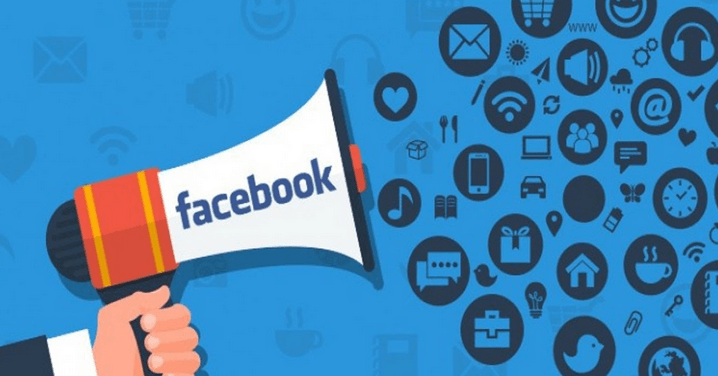 Using Facebook Ads to target your site visitors is another great way to gain some traction as they’ve already connected with you before through your website and Facebook Ads is a great way to connect with them again. Use the custom audience targeting option to target people who’ve already visited your website in the past. A simple way to increase your audience and raise awareness for your dental practice is to target people who aren’t already your patients, are not on your email list and are not your Facebook fans by using a combination of demographics, interests, or behaviors. There are unlimited combinations of interests that you can make for your target audience, depending on your dental practice specialty or goal for your Facebook ad. The possibilities are endless. 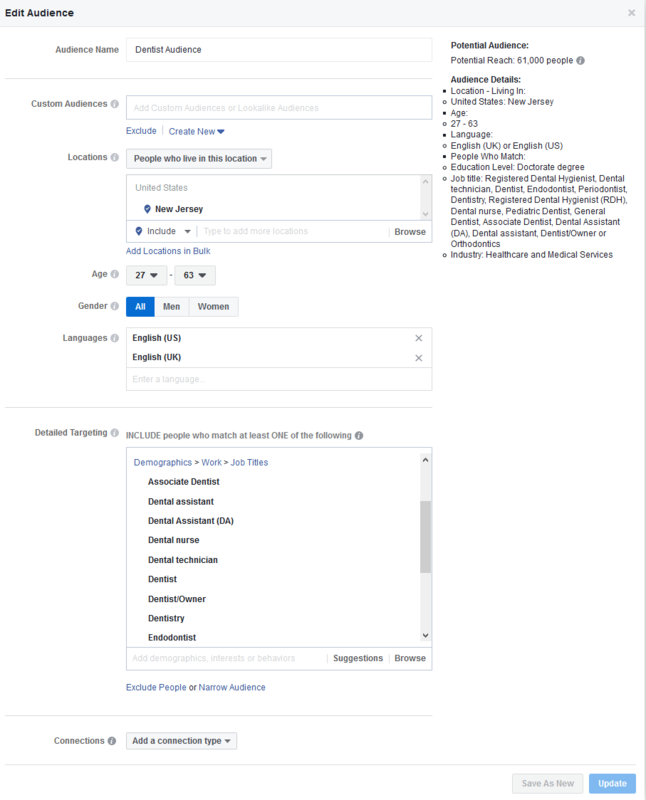 Facebook also very conveniently displays a summary of your selected audience preferences in the top right corner to give you a quick idea of where your audience targeting efforts is heading towards. When you run a Facebook Ad Campaign, you have full control of choosing your own audience which you think will bring the best results to your Facebook Ad Campaign. Facebook and its advertising platform have opened a whole new world for dentists where they control who they market themselves to, completely unheard of in the dental industry before. 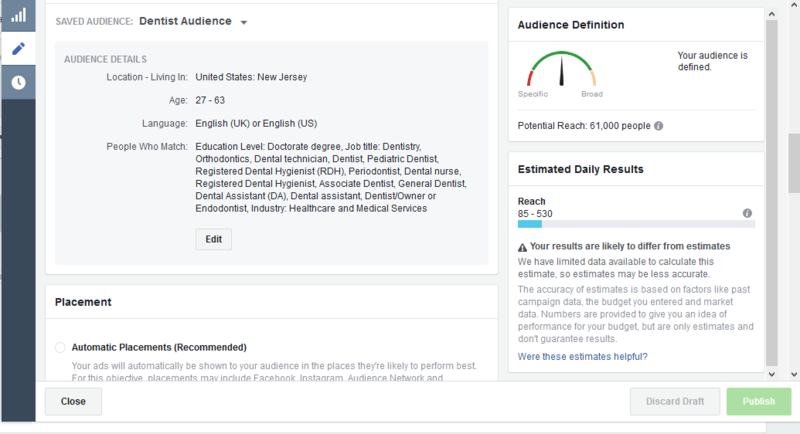 So, using Facebook Ads to unlock the true potential of Facebook by targeting the right people for your posts based on their demographics, interests and user behavior is highly recommended for dental practitioners.